The following essay, was included in a collection of travel writings about Cork, Ireland from medieval times to the present, titled: AS OTHERS SAW US – Cork through European Eyes. 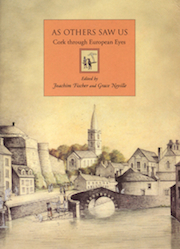 The anthology was published in 2005 to celebrate the historic designation of the city of Cork as the 2005 European Capital of Culture. The varied texts include excerpts from travel books, essays, newspaper articles and memoirs and contain the views and opinions by continental writers about Cork. 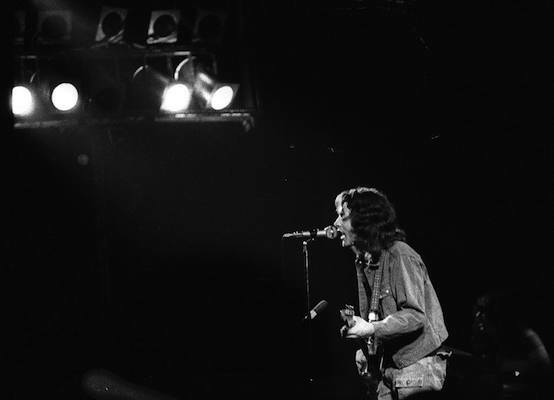 One contemporary essay, written expressly for the anthology by Juan Casas Rigall, looks at Irish legendary guitarist Rory Gallagher, Cork’s favourite son, and how his memory survives in both Spain and his hometown of Cork. Thanks to Juan Casas Rigall for allowing me to reprint this essay here. And, well, I’m one of those people. I often travel to Ireland because of family connections – although we live in Spain, my wife is a native of Rathcoole, Co. Cork. Every year, visiting Cork is a must; and during every stay in the city, walking through the nooks and crannies which Rory frequented, is always a melancholic pleasure. The tour begins in the high part of Cork, in MacCurtain Street. 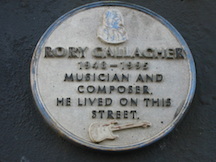 At number 29, there is a plaque that reminds us: ‘Rory Gallagher (1948 – 1995), musician and composer. He lived on this street.’ The remembrance plaque is surrounded by two images: a bust of Rory and a Fender Stratocaster, the most emblematic of his guitars. It is no accident that the plaque finds itself next to Crowley’s Music Centre, the musical instrument shop, in which in 1963 Rory bought a second-hand Stratocaster, the same guitar he would go on to play all his life. The memory of Rory is alive and well in Crowley’s, where apart from remembering him with some old photographs, they will happily tell you about his family house, just some metres down the road; it’s immediately evident that they’re used to answering questions about Rory. But, on MacCurtain Street, the footprints of Rory flower with every step. In “The Corner House” pub, the walls are covered with images of musicians and a corner is dedicated to Rory. There are also some covers of LPs and photographs of live sessions, one of them with Phil Lynott. In the centre of Cork, a beautiful square is named after Rory Gallagher with a bronze sculpture dedicated to his memory. Rory would have frequented antique bookshops in Cork, like the one found in this square (if not this very one! ), searching for novels by Dashiell Hammet, a US writer to whom he dedicated the song ‘Continental Op’. Rory is buried on the outskirts of Cork, in St. Oliver’s cemetery in Ballincollig. On his tomb, the simple inscription only mentions his name. On the headstone the setting sun is represented, but if you look closely, you will notice the rays of the sun turn into the tuning fork of a guitar. 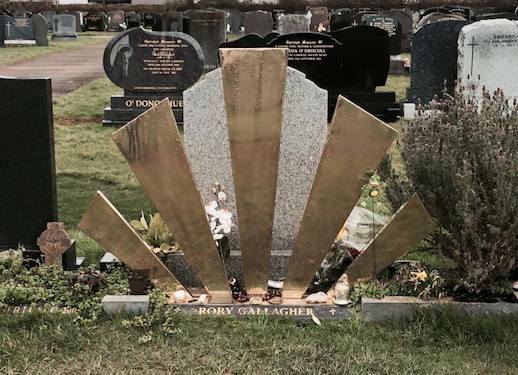 And there’s something more, which makes it hard to not get excited about: hundreds of people, every year, pay tribute to Rory with a simple homage by placing a pick, a bottleneck, a guitar string, etc. on his grave. Rory Gallagher’s music has been a fundamental influence in Spain. Those of us who were born during Franco’s dictatorship and got to know democracy as adolescents know Rory to be the Irish musician who was second to none, even above Van Morrison. Rock, and above all, blues and jazz, were rarely heard even on radio stations, outside of the big cities – in my town, there was only one record … from The Beatles! Since the death of the dictator, the musical panorama experienced a notable development. It was no longer necessary to travel to a large city to get records like The Animals, Muddy Waters or Charlie Parker. In the posters of the new music shops a young man with long hair and his trademark sideburns dressed in jeans and a checked shirt along with his guitar caught our eye – with each new recording its scratch plate was more and more worn. His name was Rory Gallagher, and after launching excellent records with his band Taste, he was now recording solo. But beyond his image, to listen to his music was a powerful discovery: his voice was sincere and energetic; his guitar was pounding, his harmonica wailing. In the simple form of trio or quartet, he mixed blues-rock with jazz and traditional music elements. Rory brought together the best of the Mississippi bluesmen, Clifton Chenier’s Zydeco with Chuck Berry’s Rock, Lonnie Donegan’s Skiffle and the depths of John Coltrane. A summarised musical encyclopaedia in a unique style, which was exactly what we needed in Spain in those times. Afterwards, when indulging deeper in the life of this musician, we discovered new and nice surprises: Rory was the antithesis of the rock star, far removed from limelight extravagances. He was a simple guy without personas, just like his music. Rory was, without a doubt, one of the most important musical interpreters in the musical evolution of the Spanish of my generation. As the years pass, our old idols are left by the wayside and forgotten, replaced by other genres. In my admiration for Rory, only two things have changed: firstly, nowadays I hardly ever listen to him on vinyl, but usually on more modern digital forms, although ever now and then, I dust down my old LPs; secondly, his songs, from ‘Sinner Boy’ and ‘Used to be’ (1971) to ‘I ain’t no Saint’ (1987) or ‘The Loop’ (1990), sound better and better to my ears. I may not be from Cork, but after listening to Rory through the years, when I visit his town, how can I not want to sing out loud ‘I’m going to my hometown; sorry, baby, but I can’t take you’? English translation by Nancy Serrano, jnr. Pues bien, yo soy una de esas personas. Viajo a menudo a Irlanda por afinidad familiar — aunque vivimos en España, mi mujer es natural de Rathcoole, Co. Cork. Todos los añs, Cork es visita obligada; y, durante cada estancia en la ciudad, caminar por los rincones que Rory frecuentó es siempre un placer melancólico. El recorrido comienza en la parte alta de Cork, en MacCurtain Street. A la altura del número 29, una placa nos recuerda: ‘Rory Gallagher (1948-1995), musician and composer. He lived on this street’. La dedicatoria está enmarcada por dos imágenes; un busto de Rory y una Fender Stratocaster, la más emblemática de sus guitarras. No es casualidad: la placa se halla junto al Crowley’s Music Center, la tienda de instrumentos musicales en donde, en el año 1963, Rory compró una Stratocaster de segunda mano, la misma guitarra con que tocaría durante toda su vida. La memoria de Rory, cómo no, pervive en Crowley’s, en donde, además de recordario con algunas viejas fotos, nos informarán amablemente sobre su casa familar, apenas a unos números de allí: se nota de inmediato que están acostumbrados a atender preguntas sobre él. Pero, en MacCurtain Street, las huellas de Rory afloran a cada paso, como en el pub The Corner House, de paredes cubiertas por imágenes de músicos y un rincón dedicado a Rory, con la portada de algún LP y fotografias de actuaciones en directo, una de ellas con Phil Lynott. En el centro de Cork, una bonita plaza lleva el nombre de Rory Gallagher, con una escultura de bronce dedicada a su memoria. Si no justamente la librería de viejo de esa misma plaza, seguro que el propio Rory frecuentó otras de las muchas librerías de Cork en busca de novelas de Dashiell Hammett, el escritor americano a quien dedicaría la canción ‘Continental Op’. La influencia de la músoca de Rory Gallagher ha sido fundamental en España, en donde, entre quienes nacimos durante la dictadura de Franco y conocimos la democracia siendo adolescentes, es considerado como el músico irlandés por excelencia, por encima incluso de Van Morrison. El rock y, sobre todo, el blues y el jazz, fuera de las grandes ciudades, eran géneros inhabitables hasta en las emisoras de radio ¡en la de mi pueblo, no había ni un solo disco … de los Beatles¡ Muerto el dictador, desde 1975 el panorama musical experimentó un notable desarrollo. No era necesario viajar a una capital para conseguir discos de los Animals, Muddy Waters o Charlie Parker. Y, en los expositores de las nuevas tiendas musicales, nos llamaba poderosamente la atención un joven de pelo largo y patillas afiladas, vestido con vaqueros y camisa de cuadros, y una guitarra que, con cada nueva grabación, tenía los barnices más y más rayados. Se llamaba Rory Gallagher y, después de lanzar excelentes discos con el grupo Taste, firmaba ya en solitario. Pero, más allá de su imagen, escuchar su música fue todo un descubrimiento: su voz sincera y enérgica, la guitarra punzante y la armónica llorona, el sencillo formato de trío o cuarteto desgranando blues-rock con elementos jazzisticos y de música tradicional. Rory amalgamaba lo mejor de los bluesmen del Mississippi y el zydeco de Clifton Chenier con el rock de Chuck Berry, el skiffle de Lonnie Donegan y la hondura de John Coltrane. Una enciclopedia musical compendiada en un estilo único, justamente lo que necesitábamos en España en aquellos tiempos. Después, al profundizar en la vida del músico, encontramos nuevas y agradables sorpresas: Rory era la antítesis de la rock star, alejado de extravagancias publicitarias, un tipo sencillo sin máscaras, como su música. Rory fue, sin duda, uno de los intérpretes más importantes en la evolución musical de los españoles de mi generación. Suele ocurrir que, con el paso de los años, nuestros viejos ídolos van cayendo en el olvido, reemplazados por otros gustos. En mi estima por Rory, sólo han cambiado dos cosas: la primera es que hoy pocas veces lo escucho en discos de vinilo, sino en nuevos formatos digitales, aunque de vez en cuando desempolvo antiguos LPs; la segunda es que sus temas, desde ‘Sinner Boy’ y ‘Used to Be’ (1971) a ‘I Ain’t no Saint’ (1987) o ’The Loop’ (1990), me parecen cada vez mejores. Y, aunque no sea de Cork, después de escuchar a Rory durante tantos años, cuando visito su ciudad, ¿cómo no cantar a voz en grito: ‘I’m going to my hometown; sorry, baby, but I can’t take you!’?